According to the Environmental Protection Agency, the average American spends 93% of his or her time indoors (87%) or in a car (6%)! The message here is that quality indoor air and water matter! In fact, they are essential to maintain good health. Fortunately, you can control many of the factors necessary to build a healthy environment. And by the way, the choices you make are good for the planet and your pocketbook, too. The optimal siting and design of a home can maximize aesthetic considerations like views as well as the collection of sunlight for natural illumination and heating (and to ward off winter blues). Properly siting a home preserves trees for shade and drains water away from structures, allowing it to infiltrate the soil on site to prevent runoff and erosion. Energy conservation is accomplished by creating a sound “envelope”—walls, ceiling, floor, windows, etc.—that moderate temperatures and sound for comfort, yet assure adequate ventilation. 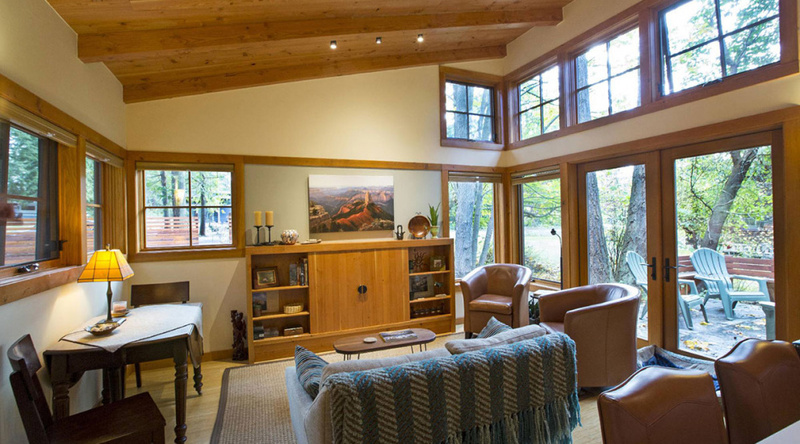 Efficient energy systems maximize comfort and minimize expenditures. Air quality management is improved by minimizing products that give off harmful chemicals or gasses, limiting the entry of contaminants, choosing low-emitting materials, and controlling indoor air pollutants. Monitoring moisture levels is also important—moisture that is too high leads to mold and mildew; too low, and skin, floors, and furniture dry out. Water quality and conservation require understanding the source of your water and efficiency of appliances, as well as paying attention to what you add to your water, such as the cleaning products, which can harm the natural environment once they leave your home. Outside, low-maintenance landscaping saves on water bills while preventing runoff and erosion. Locally sourced food is fresher and retains nutrients that nourish your body. Buying locally keeps money circulating in your local economy. There is no one-size-fits-all solution to improving your home environment. From the foods you eat to the paint you choose and the plants in your garden, each person shapes a personal environment in his or her own timeframe and to the degree they are able, motivated, and informed. Helping each of our clients to prioritize and achieve your own comfortable balance is part of what makes our approach to the home unique–affordable, easy-to-achieve solutions, that fit each budget. Let’s talk.